How does one "rage, rage against the dying of the light"? Is it an external raging or an internal? Some know that death is coming to get them. Some die a lingering death of illness and sickness. They can prepare. Others die shockingly quickly. Facing death is an intimately personal moment, but one that speaks to the interior character of a person. Eleven German spies faced British firing squads at the Tower of London during World War I. They came from various background and nationalities. They each faced their impending death differently. No one asked these men about their feelings in the moments before their executions. Were they terrified? Most likely. Mark Twain said "Courage is resistance to fear, mastery of fear -- not absence of fear." There is no courage where there is no fear. It is what you do with the fear that distinguishes courage from cowardice. Lody was a 39 year old German citizen and a former Naval Reserve officer. Muller was born in Russia and living in Holland when the war broke out. He was 58 years old. "[Muller] broke down badly the night before his execution. All through the long hours his guards could hear him sobbing for his wife and children, all forgetful of the evil he had done. He recovered his self-possession a little when the fatal call came with the dawn, and was led forth into the miniature rifle range, where nothing would satisfy him but to shake hands with the firing party. After some little hesitation his wishes were acceded to, and he solemnly went up and down the line of men waiting with rested rifles, shaking hands one by one, telling them he bore no animosity for the duty they had to carry out. Then he was placed in the chair and blindfolded and went to his death, it not exactly with composure, at least with a certain resigned courage which redeemed him in the eyes of the world." (Felstead, 51). Janssen and Roos were two Dutchmen who had been recruited by the Germans. Janssen was about 30 years old while Roos was 32 years old. "They were to be shot at 6 am and 6:10 am by a detachment of the Scots Guards; not in the miniature rifle range this time but in the Tower ditch... Janssen was led forth to face the firing-party. His iron nerve, which had not deserted him throughout, held good to the finish and he died as he had lived, a brave man. Melin was an out-of-work Swede. He was 49 years old. Roggen was a 34 year old Uruguayan whose father had been German. Buschman was born in Paris, France of a naturalized Brazilian father (originally from German) and a Brazilian mother (of Danish extraction). He was 25 years old. Breeckow was born in Germany and later apparently became an American citizen. He was 33 years old. "The last scenes in Breeckow's misspent life will live for ever in the memory of those compelled to witness them. During the five weeks between his condemnation and execution the spy broken down completely and passed his time in a state of apathetic existence which might have interested a psychologist but certainly disgusted the hardened military officials entrusted with his care. On the morning of his execution he was led out in a state of collapse. When placed in the death chair he produced a lady's silk handkerchief, evidently a relic of some past love affair, and requested that it might be placed around his eyes instead of the usual bandage. But when the sergeant-major tried to meet his wishes, it was found that the handkerchief was not large enough, so it was knotted to the bandage and then tied. Meyer claimed to be a Dutchman and was 22 years old. "The scene which took place at his execution at the Tower on December 2, 1915, revealed the cowardly nature of the man to the full. It was fully expected, judging by his demeanour during the period he was waiting to be shot, that he would prove awkward, but nothing untoward happened until the morning of his execution. When the dread summons came in the cold dawn he was then in an hysterical state and when escorted from his cell suddenly burst into a wild effort to sing 'Tipperary.' His guard attempted to silence him, but all in vain. He stopped on reaching the miniature rifle range where he was to be shot and cast a raving eye at the chair standing in the middle. Then he burst into a torrent of blasphemous cursing, reviling his Maker and calling down the vengeance of Heaven on those who had deserted him. Struggling fiercely with his stalwart guard, he was forcibly placed in the chair and strapped tightly in. Before the bullets of the firing party could reach him he had torn the bandage from his eyes, and died in a contorted mass, shouting curses at his captors, which were only stilled by the bullets. Zender was a Peruvian and an army reserve officer. He was 38 years old. Whether they faced their executions with courage or cowardice, each of the World War I spies faced the same fate, death. The spies were buried in East London Cemetery, Plaistow. 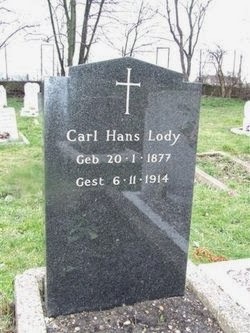 Carl Hans Lody's grave is marked by a headstone placed by friends of the family. Gravestone of Carl Hans Lody, East London Cemetery, Plaistow. The other spies were interred in common graves that have been reused several times over. 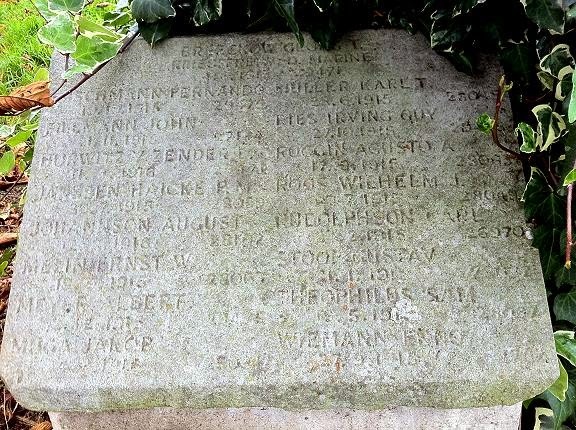 A common headstone commemorates their final resting places and includes the names of of seven German prisoners who died of ill health or accident. Felstead, Sidney Theodore. German Spies at Bay, 1920. Sellers, Leonard. Shot in the Tower, 1997.